Embrilliance embroidery software for Mac and PC. » FAQ: How do I use .BE embroidery files and Embrilliance Express? FAQ: How do I use .BE embroidery files and Embrilliance Express? What is a .BE embroidery file and how can I use it? The .BE format is the Embrilliance working file format – it allows users of Embrilliance Platform programs to make changes to their designs and then save stitch files for any embroidery machine. Owners of any Embrilliance Platform title such as Essentials already have the program they need. What if I don’t currently own any Embrilliance programs? We provide a FREE limited-function program with our platform called Embrilliance Express which will let you open, view, and save the design in your machine’s stitch file format. How do I get Embrilliance Express? What operating systems does Embrilliance support? We offer our platform, including this free program, to BOTH Mac and PC owners! Windows and MacOS versions are always available for all our products. Is Embrilliance Express actually free? Will I need to sign up for a mailing list to get it? YES; it is FREE, no strings attached! We don’t ask for your personal information. If you’d like to sign up for our newsletter, we welcome you to join so that you can receive free projects, sales announcements, and news from Embrilliance, but we don’t require anything from you to use Embrilliance Express. How do I install and run Embrilliance Express? Install the program as you would any other software – Windows users may have to unzip the file first. Run the Embrilliance software. 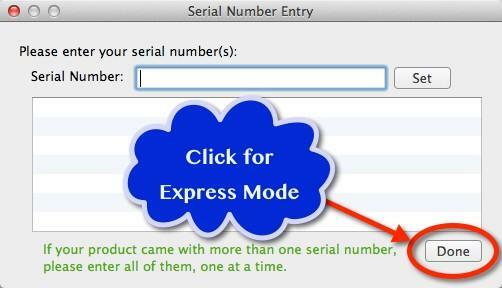 You will be prompted to enter a serial number – To enter Embrilliance Express mode, simply leave the field blank and press ‘Done’. How do I open a .BE file? Once you have the program installed, you can drag and drop the .BE file onto the open program window, double click on the BE file and and have it automatically open into your software, or use the ‘File’ menu and ‘Open’ command within the Embrilliance Platform. If you make changes to your file and save it, you can open it again later to make more changes or save a new stitch file in another format. How do I save a file for my embroidery machine? Go to the File menu and click on ‘Save Stitch File As’; In the file saving window, you’ll see a drop-down menu at the bottom with a selection of machine embroidery formats. Select your design format, specify the folder in which you want your design saved, and click save. What else can I do with Embrilliance? Embrilliance Express will also allow you to install and type in fonts distributed in the .BX format, but it is limited in terms of features. Owners of full version Embrilliance products can do even more, including stitch editing, personalization, combining designs, applique, and even digitizing! Please check out the full versions of our programs such as Essentials, Enthusiast, and StitchArtist to learn more about their other useful, fun and easy features.